Statement which is still ongoing. expected to submit a report to Government by the 29 March. does not include any detail on actual flightpaths. proposal go far beyond that described and assessed in the Airports NPS. Sustainability in the NPS and require a fresh round of parliamentary scrutiny. No clarity on plans for road and rail access and no commitment to pay for them. No assessment of the impact of construction of local air quality. from potentially being overflown for 12-hour periods with no respite from noise. No assessment of cost to local authorities of increased demand on services. relocation of the Lakeside Waste Energy plant. No plans at all to address the adverse health impacts of a third runway. No assessment of the impact of freight traffic associated with expansion. No information on possible flight paths of a three-runway airport. No detail of areas that may be newly overflown. No proposal for continued respite for communities. included in the Airports NPS? M25 or put it into a tunnel? local roads of moving the M25? increase in the level of freight handled by Heathrow? What plans do Heathrow have to introduce a road user charge around the airport? Why have detailed flight paths for a third runway not been published? What guarantees of respite are being offered to communities currently overflown? How will Heathrow finance the third runway? Posted: Tuesday, February 13th, 2018. Filed in Air Freight News, Air Quality, News about Airports, Noise News, Recent News. East Midlands Airport (EMA) is owned by MAG, the Manchester Airports Group, and the 3rd largest after Manchester and Stansted. In its most recent accounts, revenue grew by 3.6% to £62.4m for the year to March 2017 – far behind Manchester airport’s 12.5% growth to £444.5m, but slightly above the 3% for Stansted, which had a £294.1m turnover. The airport’s management hopes that being near Nottingham, Derby and Leicester, and with programmes such as HS2 and the Midlands Engine aiming to grow the local economy, it has growth prospects for the future. There are always hopes of connections to 2nd-tier Chinese cities such as Ningbo, where the University of Nottingham has a campus, India and the United States – possibly key markets in the post-Brexit world. East Midlands wants to double is passenger number, to 10 million – and almost treble the amount of freight to one million tonnes by around 2030 to 2035. It is the UK’s largest pure freight airport – for aircraft dedicated to carrying cargo – in the UK. (Heathrow has much more, but that comes as belly-hold cargo, in passenger planes). EMA handles about 350,000 tonnes of freight and cargo through a 24/7 operation. Noisy planes fly all night. Before the economic crash of almost a decade ago, East Midlands Airport had never had it so good. Passenger numbers peaked in 2008 at just under six million, with the list of destinations including Amsterdam Schiphol, Paris, Frankfurt and Brussels. But once the UK became embroiled in a global recession, holiday ideas were sidelined for many low-income families and spending was reined in by businesses, meaning the airport hit some turbulence. It has slowly recovered, with airlines like Jet2.com and Ryanair whisking families off on beach breaks and ski trips to a growing list of destinations, recently adding the likes of Naples, Split, Girona, Geneva and Salzburg. While the summer season passenger load has finally equalled the golden era of 2008, climbing by about 200,000 each year to reach 3.3 million people again in the six months to September 30 this year, the annual figure continues to lag at 4.7 million compared to around 5.8 million nine years ago. Managing director Andy Cliffe says the winter traffic has not yet reached the same heights as before but he also acknowledges another key issue – the lack of major European hubs, all key economic centres that also offer links to the rest of the world, in the list of destinations available to the East Midlands traveller. “Those short-haul destinations are an ambition to us, for sure, and it is an immediate priority for us,” he says. “Places like Paris and Amsterdam, with multiple daily frequencies, are the types of services we want to get back. “They’ll be crucial in supporting trade from our industries. In a post-Brexit climate, that connectivity to the European market is going to be really important, but it also gives us wider connections as well. “If you fly to Frankfurt, for example, you can then connect to long-haul flights. It’s the same principle to Paris and Amsterdam. We know there’s demand in our region that we can serve better, and there’s definitely an opportunity to provide more businessservices. Further afield, many businesses and the universities would like to see connections to second-tier Chinese cities such as Ningbo, where the University of Nottingham has a campus, India and the United States – all key markets in the post-Brexit world alluded to by Andy. He adds: “Long-haul connectivity is also an ambition. The region has important connections into the Indian subcontinent, which is a key focus for us. “There’s a lot of businesses in the East Midlands that want to connect into the West Coast of the USA and New York. “But you have to bear in mind that Manchester is the only airport outside London to attract a Chinese flight. “They’re difficult to make stick but we have talked about the ambition for East Midlands. “We’ve joined trade missions with colleagues from the region and began a sister relationship with an airport in Ningbo last year, which is about collaboration between our cities and regions. Qualified accountant Andy, 44, has spent 18 years with Manchester Airports Group (MAG), the parent company of East Midlands Airport (EMA) that also owns Manchester, London Stansted and Bournemouth airports. He became managing director of EMA four-and-a-half years ago, with Bournemouth Airport – the smallest in the group by far – also in his remit. Although he commutes from his home in the North West, he spends a lot of time in Castle Donington and sits on East Midlands groups including Marketing NG and Leicester and Leicestershire Enterprise Partnership. During his time at the helm, he says a “huge amount” has changed. One of his first major challenges was to replace the gap left after Monarch pulled out of the airport in April 2015 (before its eventual demise this year). The airline had begun operating at East Midlands after Castle Donington-based British Midland and BMIbaby – which had offered routes to major airports including Brussels, Paris and Schiphol – ceased trading three years earlier. Andy says: “We lost 10 percent of our traffic as Monarch provided 450,000 passengers a year. “We backfilled those with a combination of Jet2.com and Ryanair to different destinations, and now we’ve got all that back, constantly growing during that period. “We’ve grown well and the performance of the business has been very strong over the past number of years, adding new routes and carriers into the mix. “During that time, there’s been no bit of terminal infrastructure we haven’t improved, while we’ve also introduced new car parking systems and expanded the security area. As part of MAG, which is headquartered in Manchester, East Midlands is very much one of the little brothers as the third largest out of the four airports. In its most recent accounts, revenue grew by 3.6 percent to £62.4m for the year to March 2017 – far behind Manchester’s 12.5 percent growth to £444.5m, but slightly above the three percent figure for Stansted, which had a £294.1m turnover. Manchester has also enjoyed the highest increase in passenger numbers – 11.5 percent up to 26.2 million – while Stansted’s 4.7 percent rise to 24.3 million slightly eclipses East Midlands’ 4.4 percent growth to 4.7 million. Andy stresses, though, that EMA demands as much attention as others in the group, pointing out the £50m investment over the past five years. This included a new £15m runway last year that required the temporary closure of the airport, terminal improvements costing £16m in 2014 and other investments in customer-facing areas, such as expanding the security area. “The focus is right across all our airports,” says Andy, who is part of the MAG executive committee. Andy’s vision for the future – one which he says is shared by MAG and part of its business plan – is to more than double passenger numbers to 10 million and almost treble the amount of freight to a million tonnes by around 2030 to 2035. That could also mean the number of employees, currently at 7,000 people, doubling. With the core of the current airport built in 1965, he has previously spoken about building a new terminal once it reaches six million passengers. Is that still on the agenda? “Potentially,” says Andy. “We will continue to review how best to accommodate the rising number of passengers. “We’ve had 5.6 million people at our peak so 6.5 million is a good planning number. We’re looking at the options for how to expand facilities. It’s likely that we will incrementally expand in the short-term and then look at significantly expanding thereafter. While the airport already sits as the central transport hub in the region, Andy believes it could become an even more vital cog. Getting the links right to the HS2 hub station in Toton is crucial, and the airport has been mentioned prominently in Midlands Connect, the emerging transport plan that is part of the Midlands Engine strategy. Andy adds: “International connections and access to global markets is one of the fundamental parts of the Midlands Engine and Midlands Connect strategies, while the airports themselves provide economic assets in terms of the number of people we employ. “The East Midlands is forecast to be one of the fastest-growing regions outside the South East in the next year, and we have a hugely important role to play. It is the UK’s largest pure freight airport – for aircraft dedicated to carrying cargo – in the UK. Every year, it carries a total of 350,000 tonnes of freight and cargo through a 24/7 operation, facilitating about £9 billion of trade and exports. Logistics giant DHL has grown by 50 percent after a £90m expansion to the south west of the airport, while UPS has submitted a planning application for a similar-sized warehouse at the eastern end. Work also started earlier this year on a huge rail freight terminal, known as SEGRO Logistics Park East Midlands Gateway , taking advantage of links to the M1 and airport, which it will sit beside. The 700-acre “inland port” will create 7,250 jobs, alongside construction roles and 3,000 indirect jobs. Airport MD Andy Cliffe says: “The region has a strong manufacturing heritage with Toyota, Bombardier and Rolls-Royce, so cargo and exports are vital to that. “Everything from online retail through to the movement of Rolls-Royce engines and hospital products that are urgently brought in to the Queen’s Medical Centre come through us. East Midlands Airport has announced that it will undertake a full length runway refurbishment project from 5th November till 19th December 2016. Therefore the airport will be closed to all traffic for 48 hours (8pm Saturday to 8pm Monday) each weekend, on 7 consecutive weekends. The airport hopes this will cause the least disruption to its airlines, and not affect the imports for Christmas. The timing avoids the busy summer holiday season when the airport makes a lot of money out the low cost leisure travel. The plan is for around 360 workers (Galliford Try is the principle contractor) every weekend laying 50,000 tonnes of specially formulated material across 150,000 square metres of runway etc n total. While the runway is closed, the airport is also replacing over 1,200 lights on and around the area with LED lighting, which uses less electricity than the previous lighting, cutting airport energy costs. East Midlands’ runway was last refurbished in 1999, and has a natural lifespan of around 12-17 years. They are all hoping the work will be done on time and within the weekend periods. The airport hoped, in its forecasts around 2005, to have 4 times as much freight in 2016 as it had in 2004. The level has actually risen by just a few %. They also then hoped for a doubling of flights and passengers. The number of flights has barely risen and the number of passengers has slightly fallen. So much for forecasts. Posted: Wednesday, October 25th, 2017. Filed in Air Freight News, Blog, News about Airports, Recent News. Global air freight traffic has risen 10.4% during the first half of 2017, making it the strongest half-year performance for the air cargo market sector in seven years, according to IATA’s June Air Freight Market Analysis. Freight capacity for the 1H grew 3.6% compared to the same period in 2016, resulting in a freight load factor of 44.8%. “Demand growth continues to significantly outstrip capacity growth, which is positive for yields,” IATA said. In June, air freight traffic grew 11% year-over-year (YOY), down from 12.7% in May, but significantly exceeding the 3.9% five-year average pace. Freight capacity was up 5.2% YOY in June, resulting in a 45% freight load factor for the month. But IATA senior economist David Oxley reaffirmed that the “best of the cyclical upturn in air freight may now have passed … while business surveys still indicate growing export orders, the new export orders component of the global manufacturing PMI [purchasing managers’ index] has broadly tracked sideways since March.” Unless global manufacturers’ export orders increase, a moderation in YOY air freight growth will likely materialize toward the end of the year. “Nonetheless, the strong finish to 2016 and start for 2017 for freight volumes both lay the groundwork for robust YOY growth in [traffic] this year as a whole,” Oxley said. Carriers in Asia-Pacific and Europe were responsible for two-thirds of the annual increase in traffic during the first half of the year, IATA said. In June, European carriers showed a 14.3% increase in freight traffic and a 6.1% rise in capacity. Europe’s overall cargo volume for the first half of 2017 was up 13.6%, with capacity up 5.4%. The region continues to benefit from strong export orders, IATA said. Asia-Pacific carriers showed a 10.1% rise in freight volume in June, with a 7.8% rise in capacity. Year-to-date, Asia’s freight traffic has grown 10.1%, with a capacity rise of 4.8%. “Demand growth has been strongest, between 13-15%, on international routes within Asia as well as between Asia and Europe,” IATA said. Freight traffic for Middle Eastern carriers grew 3.7% in June, and 7.6% for the year to date, a slowdown from the region’s 10.8% average annual rate seen over the past five years. IATA said competition from carriers in other regions, particularly on the Asia-Europe route, has eaten into Middle Eastern carriers’ volumes. “For the first time in 17 years, the region’s share of total international freight flown in the first half of 2017 has fallen [to 13.9%, down 0.1 point YOY]” IATA noted. Latin American carriers showed a 9.8% increase in air cargo volumes in June; for the year-to-date, though, the region’s volumes are up only 0.3%. Latin American freight volumes continue to be plagued by a difficult economic and political operating environment, IATA said, noting the June volume growth mainly reflects volatility in month-to-month traffic flows a year ago instead of an upward trend in 2017. African carriers have made the biggest leaps, statistically, of all regions, with a 31.6% rise in cargo volume in June, and a 25.9% rise in freight volume for the year to date. The region, however, moves only a 1.6% market share. In particular, the region has seen a jump in traffic between Africa and Asia, and FTKs flown on the route “surged by more than 60% in the first five-months of 2017, compared to the same period last year,” Oxley said. Growth in the global air passenger traffic market reached a 12-year high in the 2017 first half, as passenger traffic grew 7.9% compared to 1H 2016 and the load factor hit a record 80.7%, according to IATA’s June Air Passenger Market Analysis. IATA attributed the year’s strong start to an improving global economic backdrop and stimulus from lower airfares. The industry’s annualized growth pace remains ahead of the average growth rate of both the past five (6.4%) and 10 years (5.5%), IATA said. IATA observed, however, that the upward trend in passenger traffic is slowing from its robust movement (about 12%) at the end of 2016 to around 7% since February. Business confidence, as measured in the services purchasing managers’ index (PMI), has flattened since January and airlines have cut back on discounted air fares (aka “demand stimulation”) to about half of what they were in 1H 2016, a trend likely to continue into the second half of 2017. Nonetheless, IATA predicted the peak northern summer travel season will likely be record-breaking. Through June 30, the biggest increases in international traffic demand were seen by Latin American carriers (up 9.4% year-over-year [YOY]) and African carriers (up 9.2% YOY). International travel within South America has increased 13% YOY, slightly offset by 0.2% drop in North-South America travel. In June, Latin American carriers saw a 9.7% rise in international traffic while capacity increased 9.1%; the load factor grew 0.4 points YOY to 82.1%. In the total passenger market, Asia-Pacific carriers and European carriers are showing the strongest growth for the first half of the year, at 10.6% and 8.8% growth YOY, respectively. Traffic on Asia-Europe routes continues to improve following terrorism-related disruptions in early 2016, though demand on international routes within Asia has paused, IATA said. Domestic traffic in China is up 15.2% YOY (compared to 9.8% growth for 1H 2016) and India’s domestic traffic increased 18.6%, down from 23.3% growth in 1H 2016. European carriers’ passenger traffic growth in the first half of 2017 more than doubled from its 4% pace in 1H 2016, attributable, in part, to increased economic confidence in the region. But IATA noted that that traffic demand growth has moderated over the past four months, as international traffic within the region has reported paused since December. North American carriers have shown a total market growth of 3.8% for the first half of 2017, as capacity has grown 3.4% and the overall load factor increased 0.3 point YOY to 83.1%. North American airlines’ international traffic was up 4.3% YOY during the first half (contrasted with 2.1% a year ago). “The comparatively robust economic backdrop in North America is expected to continue to support outbound passenger demand in the near-term,” Oxley said. “However, anecdotal evidence has continued to suggest that tourists are being deterred by the additional security measures now involved with travelling to the US.” Domestic travel in the US increased 3.4% during the first half of 2017, slower than its 4.6% growth rate a year ago. US domestic capacity was up 3.3%, resulting in an 84.5% domestic passenger load factor for the year through June 30. Posted: Saturday, August 5th, 2017. Filed in Air Freight News, Recent News. An underground warehousing project near Heathrow Airport has taken a major step forward after councillors at local authority Hounslow approved the proposal, described as “visionary” by its backer, Formal Investments. Above the subterranean warehouse would be created the largest new park in West London for more than 100 years, using extracted minerals from underneath the currently disused land. The site, alongside The Parkway (A312) and Bath Road (A4), the latter being an important road link to Heathrow, will deliver Hounslow’s share of minerals required by the London Plan, administered by the Mayor of London. Some of the minerals will be used on-site to construct the up to 177,500 sq m of underground warehousing space. The first areas of the new park will be available within 12 months of starting on site and will provide recreational space linking local communities which will include full size grass and all-weather football pitches. Work is expected to begin in 2019 with the first area of the park opening in 2020 and the first underground warehouse space is expected to be available for businesses to use from 2022 during a 15 year period of extraction, construction and landscaping activity. Samantha Smith, senior director at commercial property consultants CBRE, said: “We are thrilled to be involved in such a massively pioneering project that will establish a new concept in the UK for a new resource for urban logistics. News of the warehousing site’s approval progress comes as the hotel group Arora put forward plans for an alternative development to construct a third runway at Heathrow, which it says will result in savings of up to £6.7bn on the current proposal, which is subject to public consultation after receiving government approval last year. Arora says that its plans would reduce the footprint of the current expansion site by over 23%, thereby “reducing the amount of demolition and groundworks required, also leading to significant reduction in compulsory purchase costs”. A large plot of farmland near Heathrow Airport is to be turned into a vast subterranean city, with a public park on the top. The 44 hectare site just to the north-eastern corner of the airport, and next to the main Bath Road was the Rectory Farm, but it also happens to sit on one of the UK’s largest sites for extracting high-quality gravel. Historically the 110 acres of green belt land was agricultural but has not been farmed since 1996, and is currently sealed off from the public. Ordinarily, a gravel mine is dug out as an open-cast mine and then often the depression in the ground eventually turns into a lake. A large shallow lake is ideal for birds and wildlife, but not when its next to a major airport, so an alternative plan was looked for. What will happen is that the mine will be dug out in sections, and then the bottom where the gravel has been removed will be replaced with a large series of concrete basements. Eventually, when some 3 million tonnes of gravel have been mined out of the farmland, the were will be an underground space of some 180,000 square-meters. This could be used for warehousing, as the site is ideally placed for both the M4 and the airport, but some of it is expected to be turned into sports and leisure facilities. Above ground, the former farmland will be turned into a public park that will be around three times the size of Green Park in central London. People playing above ground will be just metres from a vast concrete bunker just beneath their feet. The rent from bunker below ground will also provide the revenues to maintain the park above ground. The warehouse and sports facilities are also expected to create up to 2,500 new jobs. Planning permission was granted this week for the project to go ahead, after it was previously reviewed by the Mayor of London. Posted: Tuesday, July 11th, 2017. Filed in Air Freight News, Air Quality, News about Airports, Recent News. Heathrow Airport is inviting trucking companies and freight forwarders to reduce emissions by using its new load consolidation app, part of Heathrow CargoCloud. Cargo operators will be able to consolidate freight loads coming in and out of Heathrow, with the aim of not only improving efficiency but also reducing the number of trucks and emissions on the road around the airport. Companies subscribing to Heathrow CargoCloud will be able to exchange and share information about any spare capacity on their vehicles, or ask for help on a load they need transporting, and the app will work to match them and they contact each other offline and discuss the opportunity. Heathrow knows it has real problems worsening local air quality, with vehicles associated with the airport adding a great deal of pollution. The Airports Commission report was particularly weak on NO2 air pollution, and ignored the emissions from Heathrow’s air cargo. Heathrow has now put out a short document attempting to convince that it is making serious improvements to local air quality. On air freight, it says it will be getting shippers to share lorry journeys. Heathrow says in 2016 it will: “• Keep pushing for greater consolidation of vehicle loads at Heathrow and aim to provide an online venue for freight operators to buy and sell empty space on their trucks by July. • Establish a sustainable freight partnership with operators by September with the objective of reducing emissions [No clue what that actually means ?] • Develop and publish our plans for building a call-forward cargo facility to reduce congestion, idling, and emissions of vehicles coming to Heathrow by the end of the year.” So that does not look like much. But Heathrow is trying to persuade the government soon. The reality is that Heathrow hopes to double its volume of air freight, with a new runway – and that freight is carried in diesel vehicles, and lorries are not producing less air pollution. There was a small decline (0.2%) in 2015 in cargo volumes at Heathrow compared with 2014 levels. The tonnage of freight (1.496 million tonnes, more imports than exports) is barely changed from the amount in 2011. Heathrow has tried to sell its 3rd runway plans partly on the grounds that it is vital for UK companies that export things needing air freight. Many non-perishable, not especially high value items are air freighted (books and brochures, raincoats and overcoats). Almost all air freight at Heathrow is belly hold, in passenger planes. DHL is the only freight airline there. Heathrow has plans (nothing started) to try to develop itself as a European cargo hub through the investment of around £180m, including a specialist pharmaceutical storage area — to support airlines to move highly valuable and temperature sensitive medicines. There would be a huge impact on local roads of all the freight vehicles, which would be diesel powered, and the NO2 pollution. IAG has a large freight hub in Madrid, shipping air cargo into Heathrow and Gatwick. Heathrow says it has restricted air freight capacity on some routes, but overall load factors were only about 60-65%. ie. there is plenty of space for more. Air freight companies would like Heathrow to allocate slots for them. Heathrow plans to double its air freight volumes in its aspiration to become one of the leading airports for cargo in Europe. CEO John Holland-Kaye announced at the British Chambers of Commerce that Heathrow will invest £180 million in the project and has its blueprint ready. Investment will be made to enhance air to air transit by building a facility on the airport for faster handling of transit cargo that arrives by air and is due to fly out again by air, reducing the times. The improvements to air freight is meant to be “essential for the growth and success of the UK economy.” (Where have we heard that before?) 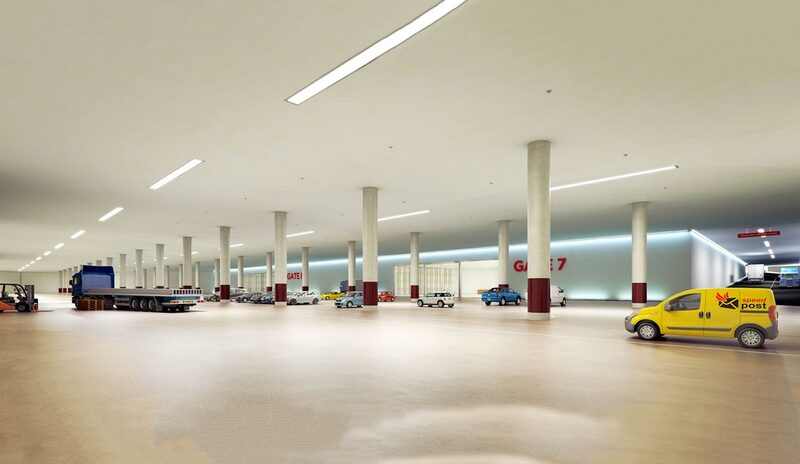 There will need to be a new truck parking facility for over 100 vehicles, with waiting arenas for drivers. There will be a special pharmaceutical storage area to move temperature-sensitive medicines and provide better infrastructure for faster freight movement. Holland-Kaye wants the UK “reach its £1 trillion export target by 2020.” Heathrow dealt with 1.50 million metric tonnes of cargo in 2014. This can only increase the number of HGVs in the Heathrow area. HGVs are all powered by diesel, not petrol – with its attendant higher NO2 emissions. Meanwhile Mr Holland-Kaye was at the EAC saying there would be no extra car journeys to/from Heathrow with a 3rd runway. Heathrow airport is keen to stress that it deals with more air freight than any other UK airport, and imply that without its air cargo exports (ignoring the imports) the economy of the UK would flounder. However, in recent years, the volume of Heathrow air cargo has been pretty much static. There was 1.76% more air cargo (tonnes) in 2014 than in 2010. In September 2010 Heathrow handled 123,680 tonnes, and in September 2015 it handled 119.092 tonnes. In October 2010 it handled 138,301 tonnes and 132,575 tonnes in October 2015. Tonnage has been down compared to 2014 every month since May. Earlier in November, John Holland-Kaye said: “Cargo is essential for UK PLC and Heathrow is its global freight connector, with 26% of all UK goods by value going through the airport.” In early November Heathrow announced £180m investment in inprove air cargo facilities and double the volume passing through Heathrow. The aspiration is that faster more efficient cargo movements will encourage airlines to increase freight capacity, boosting the UK’s global export competitiveness. And imports ?? Holland-Kaye says this will “support British businesses to keep the economy moving, connecting exporters to the world and helping the government reach its £1 trillion export target by 2020.” Air cargo has been declining at Frankfurt too. Posted: Wednesday, May 10th, 2017. Filed in Air Freight News, News about Airports, Recent News. The first rail freight train from China to the UK arrived three months ago, carrying imports. Now the first return trip is being made, on 10th April, leaving Essex, on the 7,500 mile trip. Thirty containers contain British produced goods including whisky, soft drinks, vitamins, baby products and pharmaceuticals. The DB Cargo locomotive leaves the DP World London Gateway rail terminal in Stanford-le-Hope for the city of Yiwu in Zhejiang province, eastern China. After going through the Channel Tunnel the train will pass through France, Belgium, Duisburg in Germany, Poland, Belarus, Russia and Kazakhstan, arriving at Yiwu on 27th April. The operators say it is cheaper to send goods by train than by air and faster than by sea. The service is part of China’s One Belt, One Road programme of reviving the ancient Silk Road trading routes with the West. The train link means products can be both imported and exported from the UK, as well as by ship – with both being far lower carbon modes of transport than air. Heathrow claims it is vital to the UK economy because of its exports of items like pharmaceuticals and whisky. But it makes better sense to ship these by rail, rather than use so much fuel getting them up to 38,000 feet …. Items that are non-perishable do not need to be air freighted. Frozen fish (Scottish salmon) can be carried by rail. The first rail freight service from the UK to China will depart on a 7,500-mile journey from Essex on Monday. Thirty containers filled with British produced goods were setting off on the 7,500-mile journey from Stanford-le-Hope, Essex. They include whisky, soft drinks, vitamins, baby products and pharmaceuticals. A DB Cargo locomotive will leave the DP World London Gateway rail terminal in Stanford-le-Hope for the city of Yiwu in Zhejiang province, eastern China. After going through the Channel Tunnel the train will pass through seven other countries before arriving on 27 April. These are France, Belgium, Germany, Poland, Belarus, Russia and Kazakhstan. After passing through the Channel Tunnel into France and on to Belgium, the train will call in Duisburg, Germany before InterRail pull the cargo through Poland, Belarus, Russia, Kazahkstan and arrive at Yiwu, eastern China on April 27. The operators say it is cheaper to send goods by train than by air and faster than by sea. The service is part of China’s One Belt, One Road programme of reviving the ancient Silk Road trading routes with the West dating back more than 2,000 years. DP World chief executive Sultan Ahmed Bin Sulayem said it was a “significant trade occasion”. “DP World London Gateway, one of the UK’s largest logistics hubs, is designed and developed to ensure products can be both imported and exported from the UK via ship or train in a faster, safer and more reliable way than ever before,” he added. 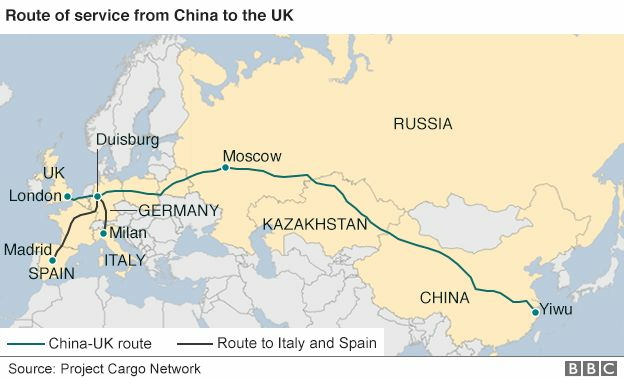 The first rail freight service in the opposite direction, from China to the UK, arrived three months ago. The journey is cheaper than air freight and faster than sea freight. The service is part of China’s One Belt, One Road programme of reviving the ancient Silk Road trading routes with the West, initially created more than 2,000 years ago. International trade minister Greg Hands said: “This new rail link with China is another boost for global Britain, following the ancient Silk Road trade route to carry British products around the world. DP World chief executive Sultan Ahmed Bin Sulayem said the first freight service from the UK to China is a “significant trade occasion”. He went on: “DP World London Gateway, one of the UK’s largest logistics hubs, is designed and developed to ensure products can be both imported and exported from the UK via ship or train in a faster, safer and more reliable way than ever before. New data has revealed over £7 billion worth of British exports travelled to China via Heathrow between August 2014 and July 2015, representing a 117% increase on the previous 12 months and over 15% of total UK export goods via Heathrow by value. China has launched its first freight train to London, travelling from Yiwu West Railway Station in Zhejiang Province, Eastern China (near Shanghai) to Barking. The trip will take around 18 days to travel over 7,400 miles (about 6,200 miles, as the crow flies). The route runs through Kazakhstan, Russia, Belarus, Poland, Germany, Belgium and France, on the way to London. The UK is the eighth country to be added to the China-Europe service, and London is the 15th city. There are hopes that it will strengthen China- UK ties. The railway is a major strategic development to assist Xi Jinping’s multi-billion dollar ‘One Belt, One Road’ strategy. The plan is to create a trade network connecting Asia with Africa and Europe along old Silk Road trading routes. There are currently 39 routes linking 16 Chinese cities to 12 European cities. The train to London carried a cargo of clothes, bags and other household items. In October a train arrived in Hamburg from China after a 13 day trip. Its 45 containers carried consumer goods, furniture, clothes, lamps and electronics, which were then transported to various European cities. The trains returning to China have carried items such as German meat products, Russian woods and French wines. Transporting goods by rail is a much cheaper and lower carbon method than air freight via Heathrow, and faster than sea cargo. Posted: Monday, April 10th, 2017. Filed in Air Freight News, News about Airports, Recent News. China launched its first freight train to London on Sunday, according to the China Railway Corporation. The railway is a major strategic development to assist Xi Jinping’s multi-billion dollar ‘One Belt, One Road’ strategy, according to the China-Europe Freight Rail Development Plan released in October. The strategy was launched in 2013 and is an infrastructure and trade network connecting Asia with Africa and Europe along old Silk Road trading routes. The returning journeys transported items such as German meat products, Russian woods and French wines. The China Railway Corporation said the train to London will strengthen the connection between China and Western Europe and improve China-Britain trade ties. China’s exports totalled $2.27 trillion in 2015, slowing down from $2.34 trillion in 2014. Its economic growth slipped to 6.9 percent in 2015 from 7.3 percent in 2014, marking the slowest growth in 25 years. The ‘One Belt, One Road’ strategy is part of an effort to boost trade and economic growth. A freight train bound for Hamburg, Germany departed the Xi’an International Trade and Logistics Park on Oct 1. It is the second time the train has departed for the German city since the route launched on Sept 2. Another route bound for Warsaw, Poland was launched from the park in August. The train’s 45 containers were loaded with consumer goods, furniture, clothes, lamps and electronics, and will arrive in Hamburg in 13 days. The products will then be transported to various European cities for sale. The two Central European routes have proved to be efficient and economical since launching in the summer and have attracted attention from numerous companies hoping to transport their goods at an affordable rate. The frequent freight trains supplying the routes are expected to foster international trade and become a key intercontinental transport mode. To complement the operation of the Xi’an-Hamburg freight train route, the logistics park will open offices in Frankfurt and Amsterdam. 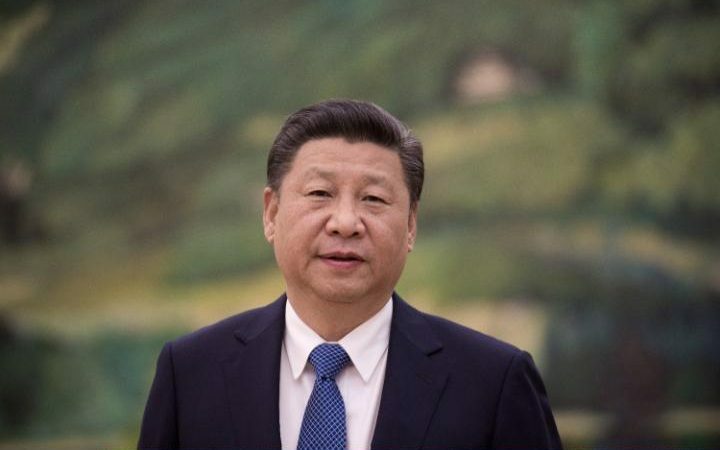 It is hoped the initiative will increase Xi’an’s global influence and support the common development of countries along the Silk Road. Posted: Thursday, January 5th, 2017. Filed in Air Freight News, News about Airports, Recent News. Tucked away in an unsuspecting building on the edge of a dual carriageway between Terminal 4 and the M25, Heathrow’s Animal Health Centre may not look like much on the outside – but inside it is a hive of activity that more closely resembles a zoo. Every year the centre, affectionately known as the ‘Arc’, accepts 80 million animals from across the globe including bears, lions, penguins, elephants and tigers. It is the place any exotic creature, pet or rescue animal must come when they first arrive in the UK. The first thing you notice is the noise. Dogs bark, cats miaow and the doors slam open and shut with flashing vehicles bringing in the new dazed arrivals from their respective flights. The smell is similar to a pet shop and attentive staff are on hand to check over the animals and remove them from their kennels so they can stretch their weary legs. My visit coincides with the arrival of Astra, a poodle cross pom from Russia and Rory, a corgi from Australia, both of whom look exhausted from their long-haul flights. Checking over Astra and Rory is animal health officer Will Hall, who is my guide for the day. ‘When they come from Australia, we try to get them out of their kennels as soon as possible. We get lots arriving in the morning from Australia, as well as the USA, and then more from Europe as the day goes on’, he explains. ‘But they can literally come from anywhere in the world’. Having been picked up from the aircraft and ferried to the centre, they are given a basic health check-up, fed and hydrated before having their IDs verified by the microchip under their skin. Dogs, cats and ferrets can enter and re-enter the UK without going into quarantine so long as they have a microchip and valid rabies vaccination under the Pet Travel Scheme. In addition to that, dogs must also have tapeworm treatment administered by a vet. The centre handles 280,000 reptiles, 28 million fish, 16,000 cats and dogs, 2,000 birds and 200 horses every year. Will, who has worked at the centre for six years, is one of the dedicated team of 26 staff who look after the animals 24 hours a day, seven days a week. ‘One of the best things about the job is you expose yourself to so many different species’, he says. The ‘dog wing’ – split between the export and quarantine side [for those coming from ‘unlisted countries’ or who failed the checks] has corridors of kennels filled with yapping dogs and whining puppies waiting to be reunited with their owners. They are put in a snug indoor area which has a 14ft outdoor run and to keep the pets happy, the Arc tries to put them in with a companion. One of the ways their health is monitored is by a graded ‘faeces scoring system’ hanging on the wall, giving a detailed explanation of each type of dog poo. Away from the barking dogs are four reptile and amphibian rooms full of snakes, scorpions and spiders. They are each placed in individual plastic boxes which have their own lighting and heating systems. Some are pets while others have been detained or seized by smugglers looking to cash in on a lucrative market – snakes with interesting markings can fetch up to tens of thousands of pounds. Snakes are also part of the ‘handling courses’ staff run for police officers and local authority workers who may have to pick up animals they are not used to. Some of the animals found at the centre are ‘stowaways’ found on aircraft or smuggled pets hidden in handbags or luggage. I spot a gecko in one of the boxes and Will says a number of African pygmy hedgehogs were recently seized by customs. All these animals have their IDs checked by specially trained staff and can then be handed over to a more suitable location if required. Inside the centre, run by the City of London Corporation, there is even a dedicated ‘exotic animal’ section where I spot an iguana, a bale of Northern map turtles seized by smugglers and the appropriately named ‘snapping turtle’. Will, kitted out in a lab coat, wellington boots and face mask, reaches in to a large area to scoop up the huge creature, another resident at the centre. As he admirably poses for pictures with the restless turtle, it demonstrates its vicious jerking movement at Will on three separate occasions. Outside there is a fish wing, a bird area with computer controlled lighting to imitate sunset, sunrise and moonlight and a horse section at the back. There is also a large room with adjustable cages for big cats and fearsome predators. As the thousands of passengers who pass through Heathrow every day prepare to board their aircraft, the cargo team on the ground spring into action. I am watching on the chilly, windswept airfield as the slick cargo team unload ten tonnes of packaged boxes into the belly of an empty AA plane, bound for Miami, before any passengers have taken their seats. The team have only 30 minutes to load the cargo and ensure the weight is evenly distributed – described as an ‘art form’ – to maximise efficiency and fuel burn. One of the main items being loaded into the belly of the plane today are flowers from Holland. Paul Griffin, AA cargo operations manager in the UK, explains: ‘Flowers, normally things like tulips of lilies, come from Holland overnight at about 4am or 5am. When they arrive in London they are X-rayed for any explosives and then put on a flight out to the US about 11am in chilled boxes. They will then arrive the following day. Aside from flowers, the airline transports huge amounts of bell peppers, cucumbers and salmon to the Far East and the US every day. It flies 100 tonnes of salmon – from countries such as Scotland and Norway – overseas on a daily basis. As the cargo team finish packing the last boxes into the plane, managing director of cargo sales Tristan Koch tells me: ‘We take it for granted but there’s always surprise at the breadth and scale of it…it’s big business. It’s all about the speed and transportation of fragile things. ‘We have cars that are held in place in special car carrying pallets which strap them down and we move very expensive racing cars. We also send out ship parts when there is a rescue situation and we send lifesaving drugs to countries that need it. American Airlines flies 100 tonnes of salmon from countries such as Scotland and Norway overseas on a daily basis. American Airlines has state-of-the-art transport equipment for perishable cargo such as produce, seafood, flowers and live tropical fish. Before cargo reaches the aircraft it is held in huge storage warehouses. The Mixed Freight Services, in Feltham, is one such company that delivers freight to the airlines. In front of the never-ending piles of boxes they have in their storage units – including one with a Ryder Cup 2018 ticket stamped on it – are two shiny supercars, a BMW and Mercedes. Pointing to the flashy motors, he explains: ‘These are going to Bangkok and Thailand…people there want to be seen with good things, like we were in the 1980s and they show their cars off on weekends. They typically want English things as they are seen as being better quality. ‘Everything is security checked for bombs, so to make sure the supercars are safe we have to drive them.’ He chuckles before adding, ‘apart from the Formula One cars we get. I ask what is in particularly high demand ahead of the frenetic Christmas period. His response is not what one might expect. ‘Avatar baby bottles and baby powder, mainly going to China. We are collecting 80 pallets every day. The pound is weak at the moment and people like British brands. Steve, who has worked for the company since 1989, has seen almost every item imaginable pass through his doors. ‘You just can’t predict what’s going to come in’, Nick Platts, the airport’s jovial head of cargo, interjects. ‘People don’t realise that 30/35 per cent of UK trade value comes from Heathrow and a third of all UK trade comes from Heathrow. As a port it’s more valuable than Felixstowe, Southampton and Liverpool…people don’t understand how important air cargo is. ‘Heathrow currently serves 180 routes, over the next few years it’s not just about opening up new routes and adding capacity but increasing the frequency of the routes we currently serve. Posted: Thursday, December 29th, 2016. Filed in Air Freight News, News about Airports, Recent News. Heathrow’s CEO John Holland-Kaye has described as “shocking” the problems that the airport – and its freight especially – causes the local community, following a bike ride through Colnbrook with Poyle with Parish Council chair Peter Hood in April 2016. He used Heathrow airport’s intranet to tell employees about the “shocking” impact of ancillary operations, and the “haphazard way” in which huge cargo sheds and smaller warehouses have sprung up in the middle of residential neighbourhoods. He said “it was shocking, and there is no one organisation you can hold accountable”. He recognised that villages such as Colnbrook, Bedfont, and Feltham were already being hit with “congestion, pollution and antisocial behaviour” as a result of activities associated with “keeping Britain’s trade flowing”. He added: “So it is up to us to bring together cargo companies, landowners, councils and residents to stop lorries messing up local communities. It won’t be easy, but if we take a lead, we can be a good neighbour to Colnbrook and other villages.” No specific actions have so far been announced yet, however. Heathrow’s CEO John Holland-Kaye has described as “shocking” the problems that the airport causes the local community, following a bike ride through Colnbrook with Poyle with Parish Council chair Peter Hood this week. The CEO of Heathrow has used the airport’s intranet to tell employees about the “shocking” impact of ancillary operations on local communities. Following a bike ride through the parish with Cllr Peter Hood of Colnbrook Parish Council on Thursday John Holland-Kaye hit out at the “haphazard way” in which huge cargo sheds and smaller warehouses have sprung up in the middle of residential neighbourhoods. He added that “it was shocking, and there is no one organisation you can hold accountable”. Mr Holland-Kaye has campaigned hard for a new runway though the parish, claiming that a Third Runway will deliver £211bn in economic benefits across the UK by 2050 partly by giving exporters access to up to 40 new destinations and emerging markets. But he noted that villages such as Colnbrook, Bedfont, and Feltham were already being hit with “congestion, pollution and antisocial behaviour” as a result of activities associated with “keeping Britain’s trade flowing”. Cargo in the community: John Holland-Kaye’s blog post to airport employees this week. He has promised to take a lead in bringing cargo companies, landowners, councils and residents to address the issue in order “to stop lorries messing up local villages”. No specific actions have so far been announced yet, however. The Parish Council was told of Holland-Kaye’s offer to tour the village on bike at its last meeting earlier this month. The invitation to directly engage with the airport’s boss in such a unique manner was extended to “others who might like to join” – but, unfortunately, was not shared with residents other than the two members of the public who attended the meeting. Posted: Tuesday, November 29th, 2016. Filed in Air Freight News, News about Airports, Recent News.